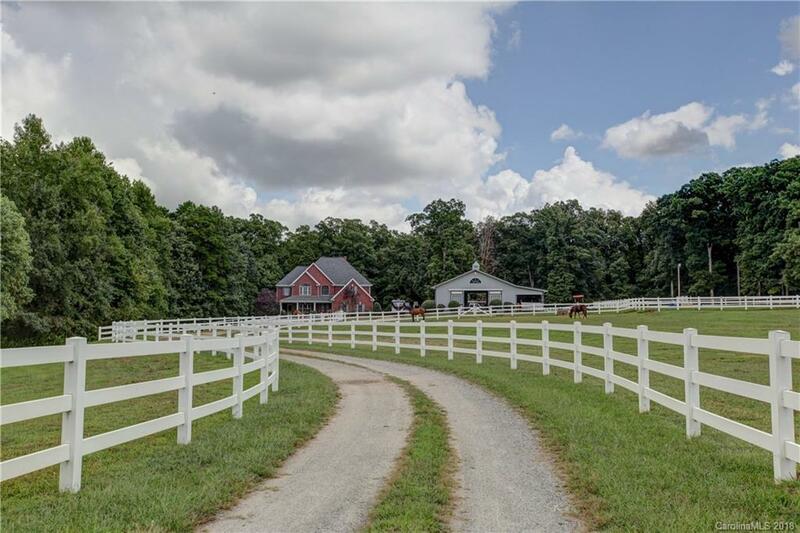 UNBELIEVABLE price reduction and opportunity to own the Most unique horse farm in Huntersville! Live on a farm within 15 minutes to Charlotte!! Extraordinary value for this custom built 5300+sq ft home on 6.4 wooded acres w pastures, riding ring & barn.Exceptional features, include a gourmet kitchen, breakfast nook and sitting area, formal dining,living area, one bedroom with bath on main and 3 bedrooms and a bonus on upper floor. Basement can be used as 2nd living quarters, has a full bath, bedroom, wet bar kitchen area, exercise room and room for a pool table.House is wired for generator and has surround sound throughout. Enjoy your screened porch overlooking lovely woods or sit on your front porch looking into the pastures. To accommodate your horses there is a complete full-service barn with internet, 7 - 12x12 matted stalls, 288 sq ft tack room w bathroom, 3 separate fenced pastures, & a lighted arena w irrigation system. Be sure to Enjoy the attached video of the property.